Despite initial scepticism and concerns, banks and financial institutions have followed the trend and incorporated web analytics into their strategy. Their reluctance is justifiable, because it involves concern for the privacy and data security of their clients. Another layer of complexity comes with the stringent and dynamic regulatory landscape, where GDPR and ePrivacy are giving everyone headaches. And it’s not enough to just buy some software and set it up. Banks are struggling with the adoption of analytics tools and the many related challenges. Often they still aren’t seeing the results they expect. In this post we share a case study of one of our clients, European Financial*, to discuss what issues and obstacles banks face in mapping the customer journey across all digital channels. That said, there’s nothing special about pointing out problems – what counts most is how Piwik PRO has helped to solve them and paved the way for future improvements. Although every case is unique, this case study most definitely includes some tips and tricks useful for every financial organization. *Our client’s name has been changed to protect their confidentiality. European Financial, a leading bank in the European Union, offers services for individual customers and small businesses. Their products range from current accounts, loans, mortgages, and deposits, to bank assurance and investment products. They are consistently on top of changes in consumer behavior, such as the migration towards online banking and increases popularity of mobile banking activities. Although European Financial was already using some analytics software, they still struggled to address critical issues and encountered numerous problems making their activities difficult. Fragmented, sampled, and incomplete data from analytics on web, mobile, a CRM platform, and offline records. Having their data sampled and reports from incomplete data due to exceeding Google Analytics limits. Not being able to reach secure member areas with Google Analytics and using it only for the pre-sign-in part of the customer journey. Security and privacy requirements limiting analytics and requiring European Financial to store data on servers in its home country. Trouble with properly tracking activities in their m-banking iOS and Android apps. Not having a clear picture of how their customers behave at all online touchpoints. Long deployment times for new marketing tools and tags. independence from IT department + quick iteration on new ideas. Piwik PRO’s Analytics, Tag Manager, and Customer Data Platform were selected for use by the Marketing & Communications department of European Financial. With the new Piwik PRO platform they at last obtained a clear picture of their customer journey. First of all, our team provided a secure on-premises CDP that ultimately allowed the client to tie their buyer personas to real website users. The platform merges all CRM, web, and mobile behavioral data into a single customer view. Then, our team helped European Financial to meet all the data security and privacy requirements imposed on them. For an organization like a bank that deals with tons of sensitive data, this is a matter of paramount importance. It was achieved by providing an on-premises hosting option and full GDPR compliance. Piwik PRO also enables acquisition of data from secure transactional areas. In this way, European Financial can now obtain valuable data from their users while at the same time keeping 100% data ownership. Ultimately, the switch to Piwik PRO allowed European Financial to speed up deployment of their new marketing arsenal. Moreover, it also gave them independence from their own IT department and their work cycles. European Financial can easily place and manage all tags in a secure manner using Tag Manager. 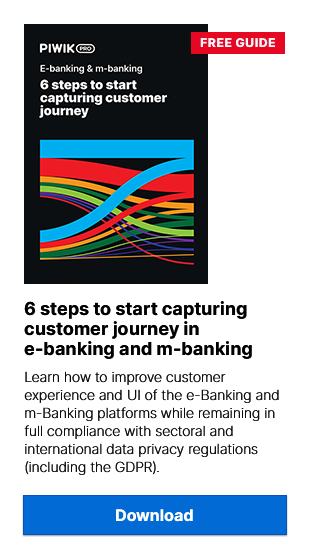 McKinsey Consulting has performed an in-depth study and analysis of the banking industry. In it, they found that the best potential source of increased revenues lies in a better data ecosystem and analytics-based decision making. Our use case demonstrates how that’s troublesome and complex in the finance world, as internal and external regulations impede these changes. However, this doesn’t mean there is no solution guaranteeing secure and privacy-compliant analytics for the banking industry. The case study of European Financial shows us how you can maintain the highest level of data security while gathering data from secure member areas and mapping the whole customer journey.